Jungle Adventures best offer for discounted admission tickets online. Save $4.00 on Adults, $3.00 on Seniors and $2.00 on Child admission prices. Must be purchased online to receive this offer. Present ticket voucher upon arrival. A "order processing fee" is included in final purchase price. 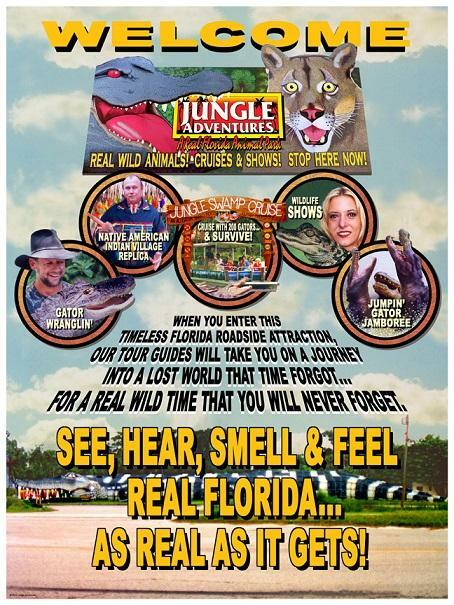 Jungle Adventures appreciates all branches of the United States military, Police and 1st Responders with a special exclusive discount for them and their families. Valid ID required upon purchase. Visit with family, Buy 1 Adult Admission, Get 1 Adult Admission (BOGO), plus $1.00 off the next six (4) admissions in your party. Visit by yourself and receive 20% off a Full Day Adult Admission. JANUARY, MAY and SEPTEMBER: Florida Residents Adults get $4.00 OFF Full Day Passes, Seniors 60 and older, and Children, ages 3-11 get $4.00 OFF Full Day Passes. Valid Florida ID required upon purchase.